The business idea came from watching morning television. A 'Good Morning America' segment showed a guy advertising pizza in a cone -- an on-the-go variation on the ubiquitous food. The company being shown, Kono Pizza, was advertising franchise opportunities and a local family decided to go for it. “We think Philadelphia is an attractive market,” said Eric Ciancaglini, a local franchise co-owner. Kono started in Italy before expanding into the United States in 2013. And that European connection is still a major part of its brand -- some of the product’s ingredients are shipped over from Italy for use in America. The first U.S. branch opened in Edison, New Jersey, but there weren’t any that ever reached the Philadelphia area. Ciancaglini realized there was a vacuum. “There was basically an opportunity in Philly there for us,” he said. The final product at first glance resembles an ice cream cone -- the outer crust’s tanned exterior mildly resembles the shape of a sugar cone. Inside, there are many of the traditional ingredients of pizza-by-the-slice: marinara sauce, cheese and a selection of toppings to choose from, ranging from turkey and ham to Nutella. 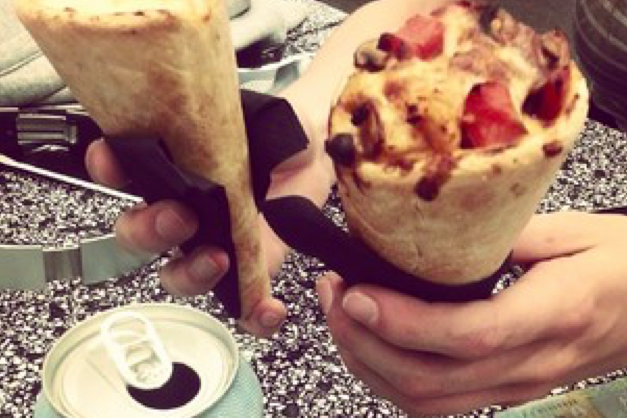 The point of having pizza in a cone instead of by the slice is that it is easier to eat on the go, has fewer calories and still maintains the taste of pizza, Ciancaglini said. Eventually, he came around. He is a recent graduate from the University of Maryland and said it was hard to eat pizza while walking across campus -- a problem that could be solved if the food was in cone form, Ciancaglini said. Ciancaglini is going into business with his uncle and father -- it was his dad who originally saw the "Good Morning America" segment and pitched the idea. The local franchises will pop up as mobile carts that can be transported around the city in an enclosed trailer. His first mobile cart should be up and running in August, Ciancaglini said. And they hope to expand. In the first few months, the cart probably won’t have a regular location but will be moving around the city. “We are trying to go maybe [an additional] cart a year,” said Ciancaglini, adding that they bought the rights to five franchises, which came with a franchise fee of about $90,000, according to the Kono website.